Click on the picture to download the flier! - considering their next steps in terms of education and/or employment or not currently in education, employment or training. • Young people with special educational needs and/or disabilities, aged 14-24, as mentioned above. 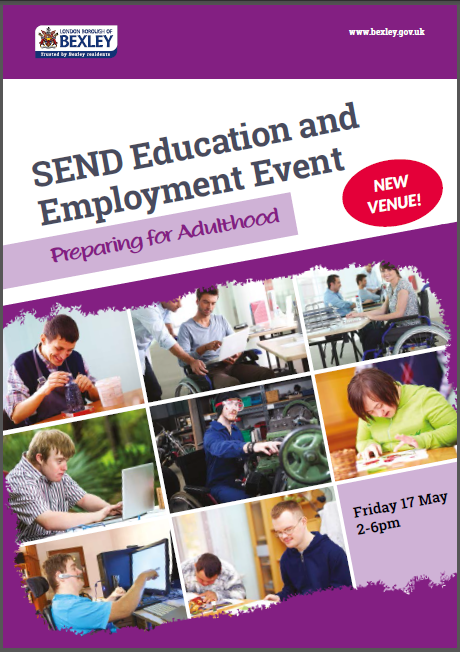 This event is focused on helping our young people with special educational needs and/or disabilities to plan clear and accessible progression routes from education to employment. It will provide young people and their parents/carers with the opportunity to travel along the ‘Preparing for Adulthood journey’, with the opportunity to speak with organisations and teams from the different milestones of the transition period between ages 14 - 24.
employment teams and other employment-related organisations. • The opportunity to come along and speak with members of the organisations and teams listed below. • Access to advice regarding education and employment, and the different transition routes between the two. • The opportunity to attend presentations given by different individuals and organisations in attendance. • A quiet space for those who are in attendance but may wish to avoid the noise and foot-traffic.